Tiny House, Think Big. Build Tiny. : A Teenager's Experience Building a 170 sq ft. Tiny House with Bonus Pictures and Descriptions of the Entire Build. With no prior building experience, I began the long journey of building my own tiny house. Throughout the build, I was able to adapt to the challenges that I faced and ultimately succeeded, because I have my own place to call home. 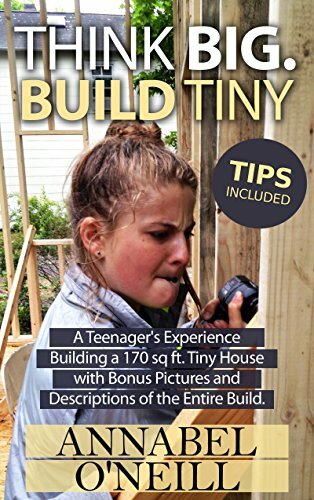 This book includes specific experience based questions relating to how it started, money, "mistakes" and how my life has changed since building my house. This eBook is dedicated to inspiring your own journey to becoming the best you you can be. It draws from personal experience and suggests ways in which to incorporate more self-love, gratitude & focus in your own life. Some topics include, Imagine It. Feel It. Write It., Me Time, Inspire & Influence, Future Self, Living an Inconvenient Life, etc.